Feel free to download any chemical calculator and try it free for 30 days. The trial versions are not fully functional - parts of the code are disabled, but everything that can be calculated in the full version can be calculated in the trial version too. You will be reminded to register the program every time it starts. If you decide to buy the program, we will send you a registration key to convert the trial version to a registered version. Select a file to download clicking on the filenames in the table. Please try first with the self installing exe package (or msi package). If, due to security reasons, you are unable to download and run this file, try zip files, which contain the same executable files hidden inside archives. If you have registered the program earlier and you have older version, feel free to download and check if the new one works with your registration key - it probably will, as all minor upgrades are free. 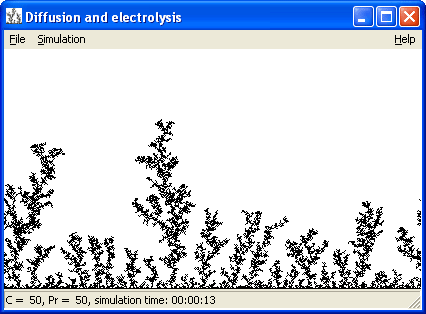 This small and completely free program simulates diffusion and electrodeposition of the substance. The idea was published in Journal of Chemical Education in 1989 - Sagues F, Costa JM, A microcomputer simulation of fractal electrodeposition, Journal of Chemical Education, 66 (6): 502-506 Jun 1989. You may play with the program just to amuse yourself, or you may use it as a tool in computer based lab.